When asked to rank the current leaders in the race to make autonomous cars a reality, Aptiv CTO Glen De Vos placed his company in the top 4. 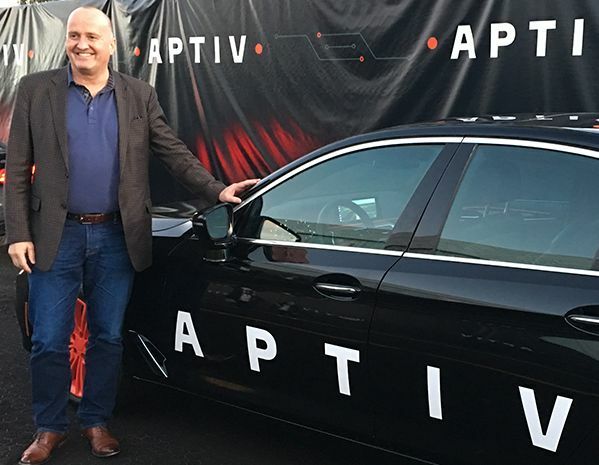 LAS VEGAS -- Targets by automakers such as Volvo Cars, Audi, Hyundai and Ford Motor to have Level 4 autonomous cars on the road by 2021 are very optimistic, Aptiv Chief Technology Officer Glen De Vos told Automotive News Europe. “People that are making claims around 2021 are being a little bit overly aggressive,” De Vos said during a test drive of Aptiv’s Level 4-capable BMW 5 series at the CES here on Sunday. Level 4 vehicles can drive themselves but still has a steering wheel and pedals so that the driver can take control when needed. At Level 5, the vehicle has no steering wheel or pedals. De Vos said that there is no reason to rush because “it’s not a one-winner-takes-all" situation. “The inflection point when it comes to volume is more around the 2025 time frame," De Vos said. When asked during the drive to rank the current leaders in the race to make autonomous cars a reality he said Alphabet's Waymo was No. 1. He also put General Motors' Cruise Automation up near the top. Aptiv's Tier 1 supplier rivals in the sector include Robert Bosch, Continental and Veoneer. He said Aptiv’s advantage is that it has a scalable architecture that allows it to provide automakers Level 1 to Level 4 and ultimately Level 5 autonomous driving capability. “Even if they are just working with us on Level 2 or Level 3, we have a pathway for them all the way up to Level 4 and 5. The investment that they make at each level is still usable across that whole spectrum,” he said. Aptiv has a fleet of 75 autonomous test vehicle active in Las Vegas. Of that group, 45 are being used by Aptiv’s r&d team for testing and the remaining 30 are part of ride-hailing firm Lyft’s network in the city. De Vos said that those cars have provided 30,000 rides, adding that the people who have been transported in the cars have given given the experience the average rating of 4.95 out of a possible five.